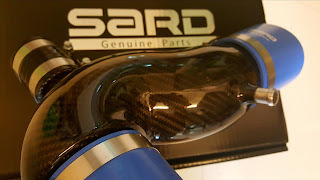 Admittedly, if you search the world wide web, there is a limited amount of real info and reviews on the SARD carbon fibre intake. It's relatively easy to get your hands on any aftermarket intake but based on my experience, it pays to invest in one that is engineered and not made just for the aesthetics. For obvious reasons, such products do not come cheap but if true gains are what you are after, there's no other way. When it comes to SARD, the company focuses on research and development for a variety of Motorsport products and have been active in GT races with platforms from Toyota and Lexus. Equipped with experiences from Le Mans races, SARD by nature is no stranger in performance tuning. That said, the SARD intake is one of the few that is actually 1.54 litres in volume, 15% over the stock OEM. While I am unsure why an aluminum or stainless steel design is not available, I can only conclude that carbon fibre was used for weight reduction (45% lighter than stock OEM) and perhaps appearance. Drawbacks? Can't think of anything except it hurts the pockets more than most. 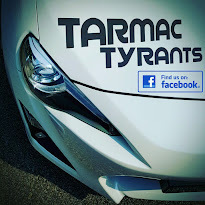 Nevertheless, the SARD intake for the GT86/BRZ/FR-S is of top quality and the carbon fibre is beautifully finished in gloss. SARD even provides a 40mm blanking plug for the sound generator delete. That's a plus because 'Toyobaru' did an awful job for the fidelity of the sound generator compared to those found in the Lexus. So, an hour was all it took and the SARD found itself in my engine bay without a fuss. Fitment was spot on with no adjustments needed. Just some basic tools like screwdrivers and pliers for the hose spring clips (if any) and you will be on your way. First impressions? I took my 86 out for a spin and noted that she pulls more effortlessly from 4500 revs and up. An unlike what many skeptics claim about intakes, I can assure you that the difference can be felt with an engineered intake. Of course it probably helped that I had a cat-back exhaust because the ins and outs of air complement each other in a tuned setup. As always, this is a fundamental governed by thermodynamics. Where there is no increased outflow, there will be no increased inflow because scavenging of air into the cylinders will not improve, especially for naturally aspirated engines. Some fair freeway driving on the second day gave the ECU some time to re-map and adjust to the increase in airflow. Today, there was an increase in responsiveness and throttle response from as low as 2500 to 3500 revs. While I have no problems with going fast, on tracks and lots of different places, I was exceptionally quicker even in the parking lot. Somehow, the car felt lighter and more eager to accelerate. Did I like it? You bet! Now I can't help putting my foot down every time and this playfulness will hurt my gas mileage for sure. But why would a silly and costlier intake make all that difference? How is it possible? 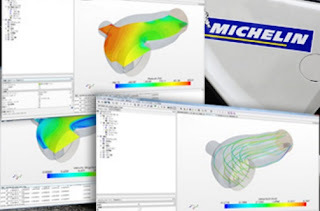 As an engineer myself, I can appreciate the work that has been done behind the scenes for a finished product and the SARD carbon intake is no exception. On SARD's product webpage, you will see some technical pictures of the intake design. I kid you not, but if you are in the know, those images were likely Computational Fluid Dynamics (CFD). CFD is a fluid mechanic study that uses algorithms to analyse fluid flows. Confused? Simply put, air is considered a fluid and with turbulent flows as an unwanted condition (unless intended by design) CFD aids in the overall design of an intake to achieve better flow. 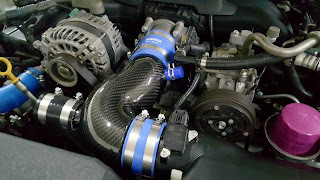 At a special price of about ¥37,000 before shipping and other charges from RHD Japan, the SARD intake is not the most expensive intake I have invested in but based on the quality it was fairly priced by RHD Japan. But try not to dwell too much over the cost because there's more fun to it than the price tag. Certainly, this is one of the best intake upgrades for me and I'd recommend it to those who are into NA tuning.